At Winter Solstice we are in the midst of dark Samhain and we are aware of the surrounding darkness. The year seems at its most oppressive. But into this darkness the light is re-born. Thanks to Bernadette for this lovely picture of the returning sun and reminder of the season. We gather to welcome the light into our hearts and to grow with it towards the fullness of Summer Solstice. snow and ice lasted from the middle of December to the middle of January. Kilkenny recorded -16 degrees and Mayo dropped to -17 degrees C.
And what do you do in a BIG freeze? 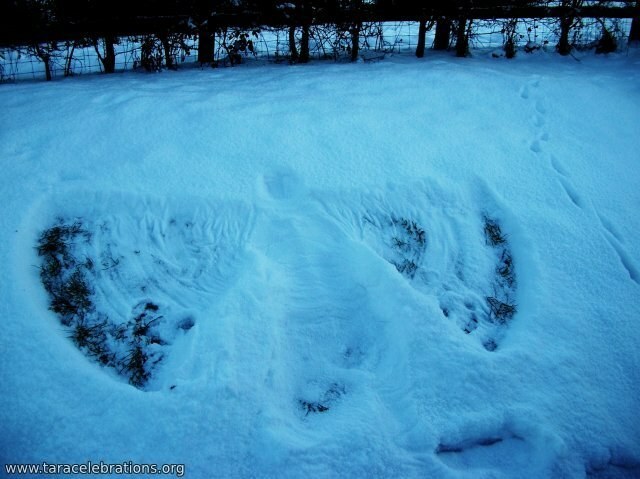 ... Go down to the Holy Well at Tara and make snow angels, of course! 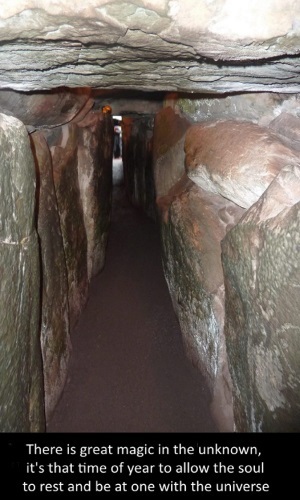 Several times we have held a winter solstice get-together at Newgrange - thanks to Bernadette for this picture of the passageway into the chamber and to others for their comments - to be found in the archived website. "Do not despair in the dark, for without the dark, there can be no light. For as sure as night follows day, as sure as the river flows to the sea, as sure as the cycle of birth, death and rebirth continues, the darkness will be banished by the Light." At Newgrange the morning sunrise shines through the spirit window/roof box and enters the inner chamber, originally illuminating the tri spiral in the back alcove. This narrow golden honey coloured beam of light is focused and appears in the chamber in a magical way that a privileged few witness every year. We feel that the light would have shone onto the ashes of the departed and acted like a sort of cosmic portal for the souls of the ancestors. May the Sun always shine in your heart and upon your path. May it warm your face when you feel cold and alone. And may it always, always nurture your hope. May you be blessed by light in even the darkest hours. Available on BBC iplayer – this is a wonderful programme with some thought provoking ideas. and they don't have to bring anything or be a certain person. In this video you will meet Dagda, share in the sunrise at Newgrange and snow on the Hill of Tara, see Tara Celebrations' past events and enjoy decorations and delights of the Season. 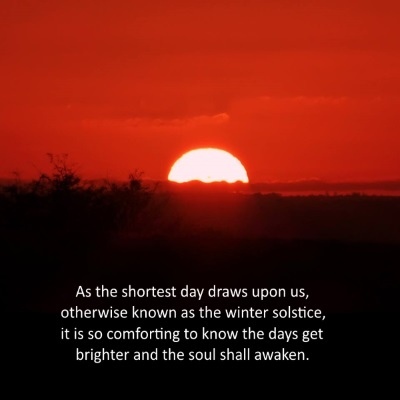 Pinterest Board - Click here for more information on festivals, places and all things Winter Solstice.